Smoked over beechwood. Delicious delicatessen foods. Mehadrin turkey. Ready to eat. Delicious hot or cold. 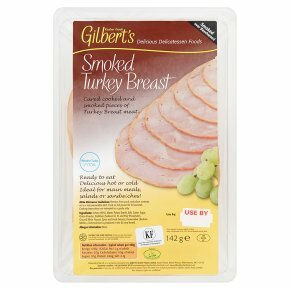 Ideal for main meals, salads or sandwiches!. Kosher - Under the Supervision of Beth Din of Federation of Synagogues. Halal - Consultations. 800w: Remove from pack, and place contents on to a microwaveable dish. Cook on full power for 90 seconds.Cooking instructions are intended as a guide only.